Contractors: Want to use the flyer above for your own recruiting efforts? Click the links below to download (member login required). Looking for insulation jobs? Fill out the form below to be added to our Job Candidate List, which is viewed by ICAA member contractors in search of new employees. Contractors in your area will reach out to you if they have any openings. Important note: Your submission will be viewable by all ICAA members. Do not include information you do not want published on our member web page. Is a career as an insulation installer right for me? Are you hard-working and adaptable? Do you enjoy craftsmanship – making something with your hands? Do you have physical stamina and a strong sense of discipline? Are you looking for a career that doesn’t require a college degree? 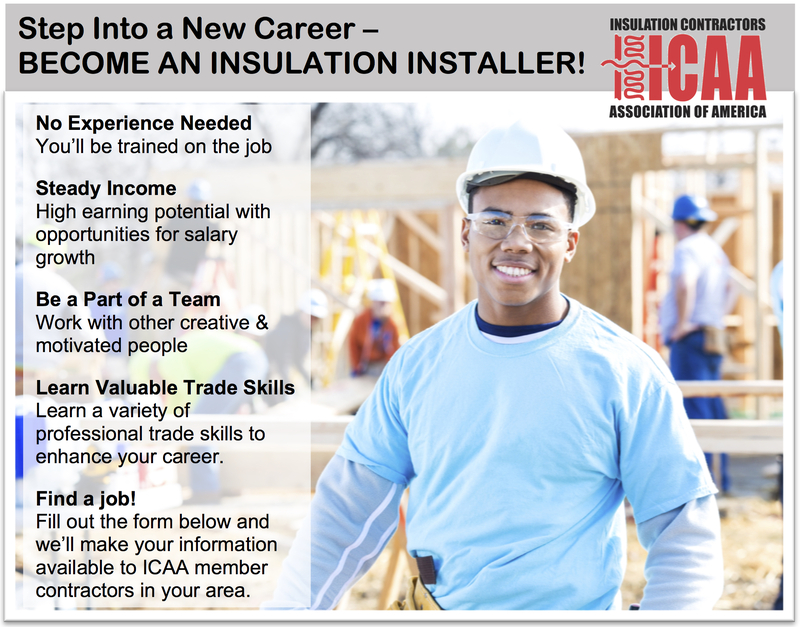 "Why should I become an insulation installer?" Check out our new video to see all the benefits of a career in the insulation industry!